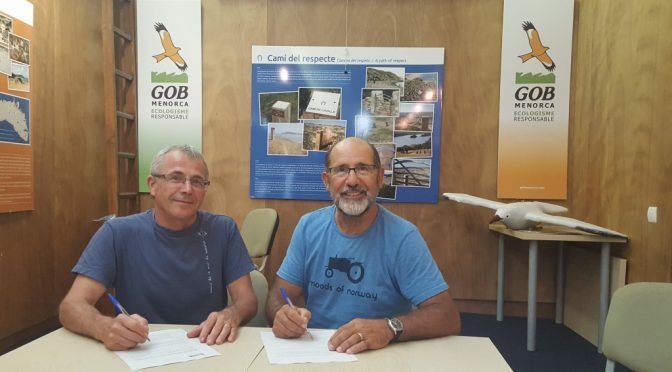 The Amics de la Mar de Menorca (Friends of the Sea of Menorca) association and GOB have signed an agreement to join together in order that any seafaring parties that they organise do not use disposable plastics in the future. Disposable plastic table ware (such as plates, drinking glasses and cutlery) is one of the most common forms of wastage generated from Menorca and which is difficult to control in wind and rain, so it finishes in the sea and across the land. There must be easy alternatives. One of these is to change thin plastic for reusable ware, as was decided to be carried out this year by the Amics de la Mar association. It can, therefore, be used for numerous fiestas. Where the size and character of the fiesta does not allow for the reuse and cleaning of materials, then biodegradable ware could be used. With this in mind, GOB has instigated a program for the maximum number of associations of Menorca to give up one use plastic ware and opt, instead, for an alternative which is more environmentally friendly. As a result of a multiple agreement with the Menorca Preservation Fund, the Marilles Foundation, the Sunseeker Company and the Blue Marine Foundation, GOB will give biodegradable ware to those associations who commit to make a change at their fiestas. They are made of cellulose materials from sugar cane, cardboard, wood and the remains of corn maze. Because of the enormous problem which is evident by the general presence of plastic in the sea, steps can be taken to reduce the use of this material when it can be replaced so easily. Encouragement will be given to groups organising periodic fiestas to join this initiative so that by 2020 there will be a significant reduction in Menorca of its unnecessary consumption of plastic.